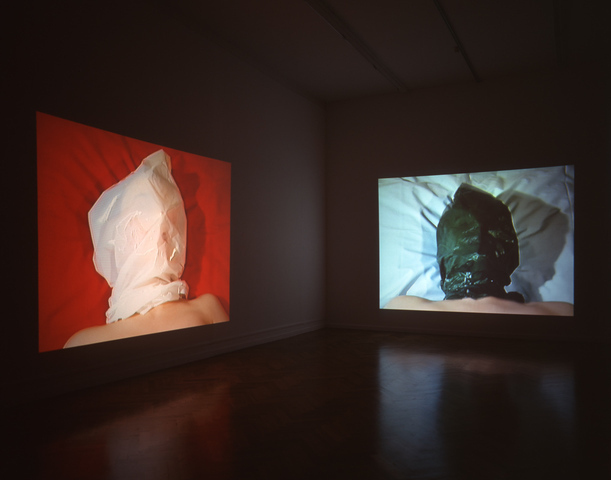 Smith/Stewart video installation 'Breathing Space' (1997) exhibited in Scottish National Gallery of Modern Art, Edinburgh, in the context of this Scotland-wide group survey show, "Generation', 2014. Other artists in Generation include: Claire Barclay, Sara Barker, Beagles & Ramsay, Ross Birrell, Karla Black, Christine Borland, Martin Boyce, Roddy Buchanan, Alan Currall, Graham Fagen, Luke Fowler, Michael Fullerton, Douglas Gordon, Louise Hopkins, Callum Innes, Jim Lambie, Jonathan Monk, Victoria Morton, Craig Mulholland, Toby Paterson, Ciara Phillips, Carol Rhodes, David Shrigley, Ross Sinclair, Simon Starling, Tony Swain, Corin Sworn, Clara Ursitti, Cathy Wilkes, Richard Wright "In the last twenty-five years contemporary art in Scotland has grown from a tiny and tightly knit scene to a globally recognised centre of artistic innovation and experiment. Generation Reader provides the first collection of key documents from the period including essays, interviews, critical writing and artists' own texts. This publication will fill a significant gap in the scholarship of the period and provide a resource for the future, an illustrated guide to the ideas, events and debates that shaped a generation. The selected archive texts from the period will sit alongside some newly-commissioned writing which includes essays by the novelist Louise Welch and by Nicola White, Dr Sarah Lowndes, Francis McKee, Professor Andrew Patrizio and Julianna Engberg. GENERATION is a landmark series of exhibitions tracing the remarkable development of contemporary art in Scotland over the last twenty-five years. It is an ambitious and extensive programme of works of art by more than 100 artists at over 60 galleries, exhibition spaces and venues the length and breadth of Scotland between March and November 2014."